Highways in the north India are known for great food in small dhabas. Well, those dhabas have seen a sea change in the last 2 decades and have now become air conditioned food courts on the highway but most of them serve good food. But the best food comes from the actual roadside dhabas where you see more the truckers less the families on vacation. Those are the little nooks that need to be discovered, the food gets etched in the memory and you yearn to get a similar daal or mutton curry or baingan bharta somewhere again. A five star hotel is the least likely place for such food and I would have all my doubts in one place if someone says there is good Punjab highway food at a swanky five start hotel. 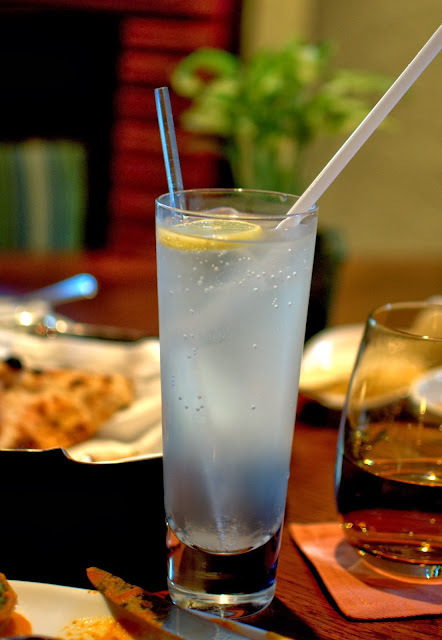 I know I had to chew my words when we had dinner at this dhaba at Claridges and I had to be more surprised again at Vivanta by Taj where we enjoyed a quite weekend lunch last week. 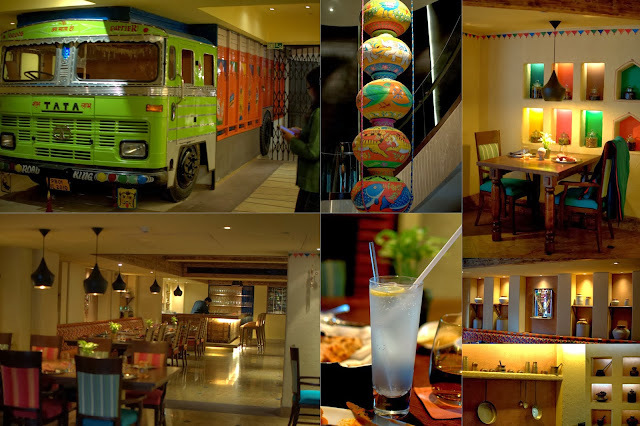 Paranda is the lobby level restaurant where you see a truck parked as you climb up the spiral stairs, the lift doors are painted green like the old homes of pind (villages in Punjab). The experience started with a golgappa shot that set the mood right. We knew we were in for good times. 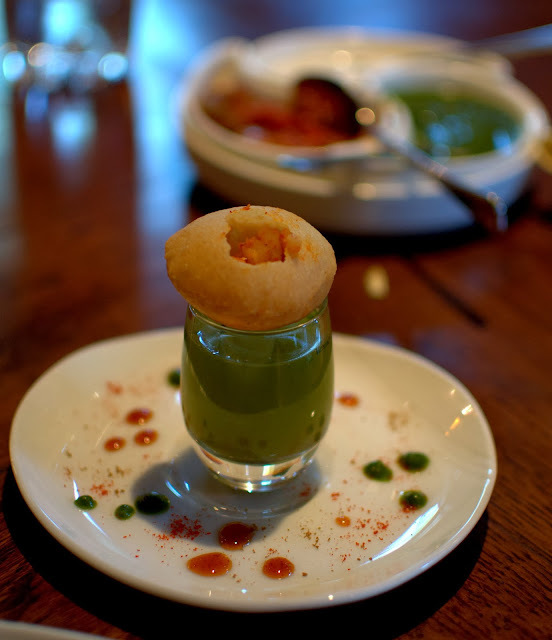 Perfectly balanced flavours in the green khatta pani and a perfectly crisp and yummy gol gappa. Thoughtful amuse bouche that hits the right spot. 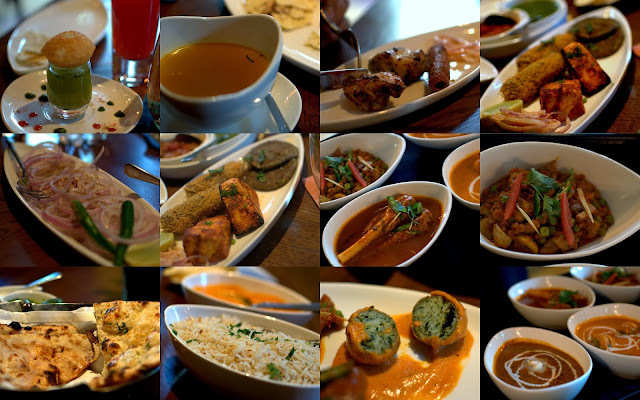 The palate craved for some more such flavours and the starters made appearance. We tried paya shorba and it was just like the one made at home with light spicing and slow cooking. We both loved it. Gosht pudine ki seekh was a tender seekh kabab with potent notes of mint. Methi machhi tikka was a tender flaky fish tikka with an aromatic fenugreek flavour, I did not miss having a singhada (river fish) tikka in those flavours. Murgh sunehri tikka was as good with subtle flavours of dill and yogurt. The best things were yet to come. I loved the dhabe di daal as it was a mushed up light kaali daal with a few bits of rajma but so well cooked that I had 3 helpings. And that is a good complement from a daal snob, I love my daals and can't have anything inferior ever.. The tari wala meat was just awesome with well done meat on the shank rich with marrow, the way I like. Very punjabi homely flavors, robust spicing and tomato base. Perfect balance. Chooza khaas makhni was a delicate take on the butter chicken and I found it good, nothing extra ordinary though. Palak kofta makhni was the same gravy with a nice and soft spinach and paneer kofta which was good. The khumb matar wala was just the way we have been having at home since ages and the dhabas do it right too. I actually took another helping of this curry. The namak mirch ka paratha was just out of this world. I normally do not eat rotis but I finished the big half that I picked up. 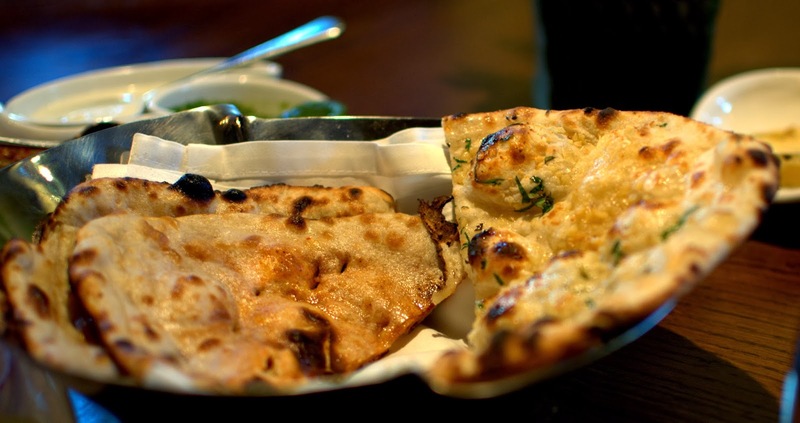 Tandoor baked roti layered with red chilly powder and salt, brushed with butter when baked. You know dhaba food well if you know the tandoori rotis I feel. I found the Jeera pulav also nice. Cooked well and subtle, so it complements well the curries and meats. All washed down with a nice chilled lime soda. The dessert platter had Gulabjamun, Kesar pista kulfi falooda and Malai chop. While i liked the kulfi, the falooda was not right. Malai chop was exactly as it should be, soft, light and syrupy, this is more of a flavour from Bengal. I would reserve my opinion on Gulabjamun as I don't like it much. I would suggest to go for only kulfi if you decide to have a dessert at all. The menu is a result of hard work and research by Chef Ganesh Joshi. His team has recreated the real flavours of Amritsar streets, the punjabi homes and the highway dhabas, the food from the land of five rivers, that is Punjab. We enjoyed the food quite a lot, the earthiness has been toned down a little, more refined gravies, subtler heat level and beautiful plating is what makes the food suitable for most urban foodies. Well thought out, superbly designed interiors and elements of the rural India in all those nooks and corners just stole my heart as those old times utensils, ceramic and glass pickle jars, pots and pans set the mood just right. I liked the way one could see the rugged Aravalis from the windows. I feel I would love to go there for the daal and tari wala meat for sure. The namak mirch ka paratha would definitely be ordered as I have been craving for those flavours since we had them.It would be a nice place to have an relaxed and elaborate punjabi dinner with friends I think. I wish some lassi, chhachh, makki ki roti-sarson da saag and safed makkhan was also a part of the menu, the experience of a true pind da khana would multiply many times..